Havering Adult College is committed to tackling poverty, social isolation and the effects of holiday hunger on children within Havering. The College delivers workshops and sessions across some of the most deprived areas in the borough, with groups who are at risk of being isolated or not engaged in services. 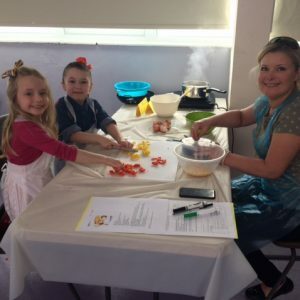 The workshops offer free hot meals, learning activities and opportunities for children and families to engage with others in their local communities. This Kitchen Social project is part funded by the Mayor’s Fund for London to provide meals to children who may be missing out on hot, nutritious meals over the school holidays because they are not in school receiving a free school meal. Research has shown that children experiencing poverty, lack of healthy meals and lack of engagement with other people and activities during the holidays leads to poor attainment and reduced participation when the children return to school. Through the workshops delivered by Havering Adult College, all children and families are welcome to participate, learn new things, prepare and eat hearty meals and make friends. Parents and families are also welcome to attend, and quite often do. These workshops are open to all families living within Havering. The workshops not only provide the nutritional gains that children need, but also make learning fun. Children are engaged in learning throughout and from feedback received, children often talk to others about what they have done over the holidays and how much they have learned and enjoyed.